India, as a developing country, has a huge platform to perform in the two-wheeler industry. So, not only the domestic manufacturers but also the international auto majors are trying their level best to offer products in this emerging market. At a place where several Indian two-wheeler manufacturers are dominating in the budgeted, fuel-efficient commuter segment. On the other side, the international bike makers are offering their premium masterpieces for different category audiences. Following the same path, the legendary Italian bike maker, Ducati, which already has a number of products available in India, is going to expand its Indian lineup with the addition of a host of products in adventure, sports and scrambler range. 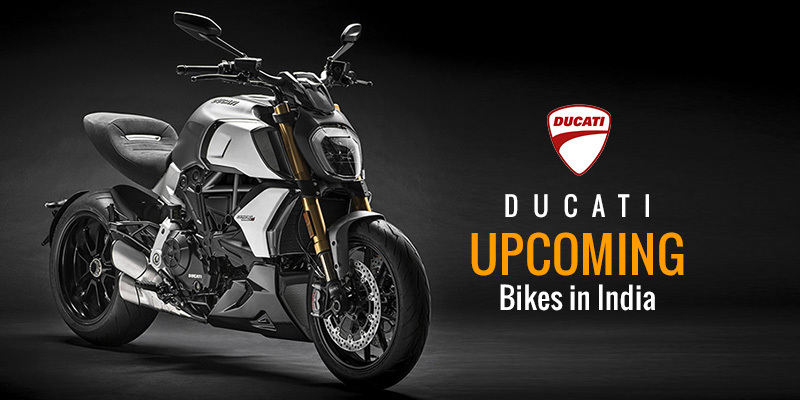 Let’s have a look at the new upcoming Ducati bikes in India and get their features, specifications, expected price, power, mileage and much more. Ducati Diavel 1260 is an updated model of the existing Diavel with more powerful 1,262 cc Testastretta motor. The motor is claimed to develop the maximum power of 159 bhp at 9500 rpm and 128 Nm of peak torque with desmodromic valve timing. Altogether, it will offer smooth performance at low revs and sporty performance at high revs, as the bike maker has made adjustments with the powertrain for such performance. For the rider’s aids, there will be a bucket full of electronic packages. Including six-axis inertial measurement units (IMU) from Bosch, three riding modes-Sport, Touring and Urban, traction control, wheelie control and cornering ABS as well. There will eight different levels to control traction and wheelie as per rider’s suite. The Ducati is gearing up to extend the portfolio of Scrambler in our country. The Italian firm will launch its scrambler bike, named Ducati Scrambler Sixty2 in the first quarter, 2018. The motorcycle gives smooth and easy riding as it is featured with a steel trellis swingarm, standard Showa fork at the front side and Kayaba rear shock and pre-load adjustable at the rear end. The Scrambler Sixty2 is powered by the air-cooled, L-Twin and 399cc engine that delivers the 41 BHP at 8750 RPM and a vertex torque of 25.3 ft-lb at 7750 RPM. The bike will be available at the expected price of INR 4.75 lakhs. The Ducati Hyperstrada 939 is an upgraded form of the Hypermotard concept with a series of cutting-edge technologies and features for a new riding experience even when you are away from home. Built around the famous Hypermotard’s steel tube trellis frame, the adventure tourer is blessed with new 937cc, Testastretta L-Twin engine. The upgraded mill is now able to deliver a peak power of 112bhp and the vertex torque of 98Nm. Respired by the oil cooling radiator, the more powerful than ever compiles the new EURO 4 emission norms. The major highlight on the aesthetics front is the sporty and vivacious character along with handguard mounted LED indicators from the automaker’s racing lineup. Electronically, it is garnished with the features like the Bosch ABS system, traction control, three riding modes option and drive by wire technology. Moreover, other utilitarian features for enhancing the riding joy on an adventure trip include touring windscreen, comfortable seat, centre stand, side bags, remote rear suspension pre-load adjuster and more. The Hyperstrada 939 is expected to launch soon as the automaker has started to accept bookings for the tourer. Potential buyers can place their order by making payment of INR 2 Lakh token amount. On pricing, it will receive an expected upsurge of INR 50,000 than the outgoing model.